What are the really important values of your family? Values are strongly held beliefs, ways of behaving and being. Look at all the values you have on your family list and write down the 5 most important values we should be living at MBS school? What do you think are the 4 best things about being at Mangere Bridge School? What do you think we need to improve on? Please hand into the school office - first class to return 100% gets a pizza lunch shout! I drink Trim flat whites extra hot. I always get them in a disposable cup. I love disposable cups because they are fast and easy to get, no washing up or worrying where I put it, they feel nice and light to carry. They are handy for putting other rubbish into when I have them in my car. It suits my routine. I buy one in the morning and one in the afternoon every school day. They cost me $4.50 a cup. People are now challenging me to stop using disposable cups. Why would I stop doing something that I really enjoy and suits my lifestyle? If you want me to change you need to convince and persuade me that I could still enjoy my coffee but give me an alternative way to do it? Working out these maths problems may help you come up with your answers. How many coffee cups do I throw out ? In one day? In one week? In one term? In one year? On Friday the 9 June contestants will have an opportunity to present their arguments to Whaea Steph. The most convincing presentation wins. This can be done as individual, pairs or groups of no more than 4. 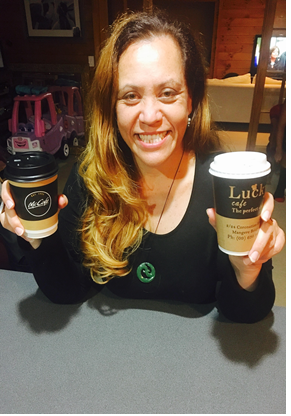 The winners get to have their photos and success story published in the school newsletter, on our website and our facebook page and….. Whaea Steph will buy you a hot chocolate to share when she has her coffee…. And you will have the pleasure of getting Whaea Steph to change.